Our Suffolk County, New York office was created out of the need to help the residents of Suffolk County with their estate planning and elder law needs. 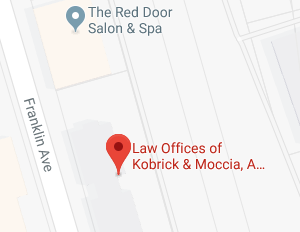 Situated in the heart of Suffolk County, on 150 Motor Parkway in Hauppauge, the Law Office of Kobrick & Moccia provides a convenient, easily accessible location where Suffolk County residents can get assistance with those legal issues that have the most significant impact on their lives – estate planning, and elder law. Suffolk County, New York is the largest of Long Island’s four counties and occupies the central and eastern part of Long Island. Surrounded by water on 3 sides, and with its temperate climate, clean water and rich soil, Suffolk County is the leading agricultural county in the state of New York. Only an hour or so away from metropolitan New York City, Suffolk County is proud of its ability to adequately plan the expansion of its towns so that the charming and productive farm county is preserved amidst the suburban expansion. The county has experienced a huge growth in population since the mass-produced housing developments and major institutions of learning arose in the 1950’s. Today, Suffolk County is home to about 1.5 million residents, and over a dozen colleges and universities, creating a unique blend of old world industries and new world suburban living that come together to form a strong community. Experienced attorneys Saul Kobrick and Anthony Moccia, travel to different locations in Suffolk County, New York, from Melville to Stony Brook, from Babylon to Ronkonkoma, and other neighboring communities, and offer free presentations on Wills, Living Trusts, Medicaid and Nursing Home Protection, to educate the community and help Suffolk residents preserve and protect their wealth. At the Law Offices of Kobrick & Moccia we realize that creating an estate plan is a highly personal and individual process. Given the importance of the finished product, choosing the right estate planning attorney should be a priority. It is important that our clients and prospective clients feel comfortable enough to discuss personal family and financial matters with us. The attorneys and staff at the Law Offices of Kobrick & Moccia pride ourselves in being able to create a comfortable and safe environment for these discussions to take place and a comprehensive estate plan to develop. Estate planning should be an ongoing process that evolves over time. As you grow and mature, so does your estate and, consequently, so do your estate planning needs. Your initial estate plan may focus primarily on protecting you and your young family from the financial devastation of unexpected incapacity or death. As you travel along through life, your estate plan may start to expand to include components that will help grow and protect your estate, such as retirement planning, Medicaid planning, and tax avoidance. You may also start to include strategies in your estate plan that will help your estate avoid probate as well as ensure that you can afford long-term care should you need it in the future. At the Law Offices of Kobrick and Moccia, we would be honored to be with you at each step of your journey through life and help you create an estate plan that protects you, your family, and your assets. If you have questions or concerns regarding your Suffolk County estate planning needs, contact the experienced New York estate planning attorneys at The Law Offices of Kobrick & Moccia by calling 631-941-3400 to schedule your appointment, or to register for one of our estate planning or Medicaid seminars.